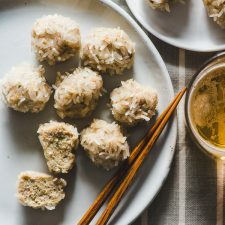 The tender and moist pork meatballs are covered with gooey rice. Fun to cook and great tasting! When I was a kid, both of my parents worked and neither really had time to cook complicated things for dinner. So my grandma used to make meat dishes for us, to free my mom from spending time in the kitchen after a long, busy day. She would cook various dishes in large batches, transfer them to small bowls to cool, bag and freeze them in meal-sized batches, then pass them to my parents every few weeks. She was very proud of her cooking, and for good reason. Her braised pork ribs, braised pork feet, beef and tendon stew, and lion’s head meatballs were amazing. They tasted much better than what you’d get in a restaurant. Every morning, my mom would take out a prepared meat dish to thaw, then reheat it by steaming right before dinner. At the same time, she’d cook some rice in the rice cooker and prepare one or two stir fried veggie dishes and a simple soup. The whole dinner usually took 30 to 40 minutes to get ready. Just like this, I grew up with very satisfying and nutritious meals every day. 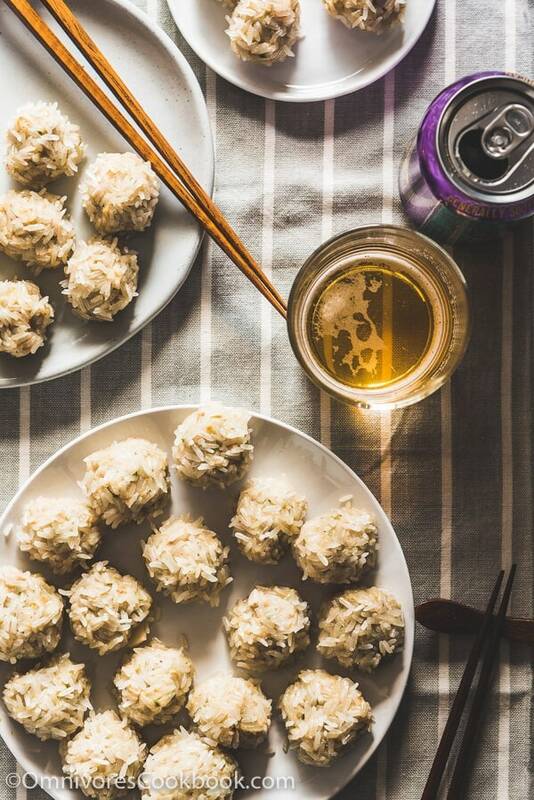 Among the meat dishes my grandma made, the pearl balls are one of my favorites. We also call them snow meatballs in my family. 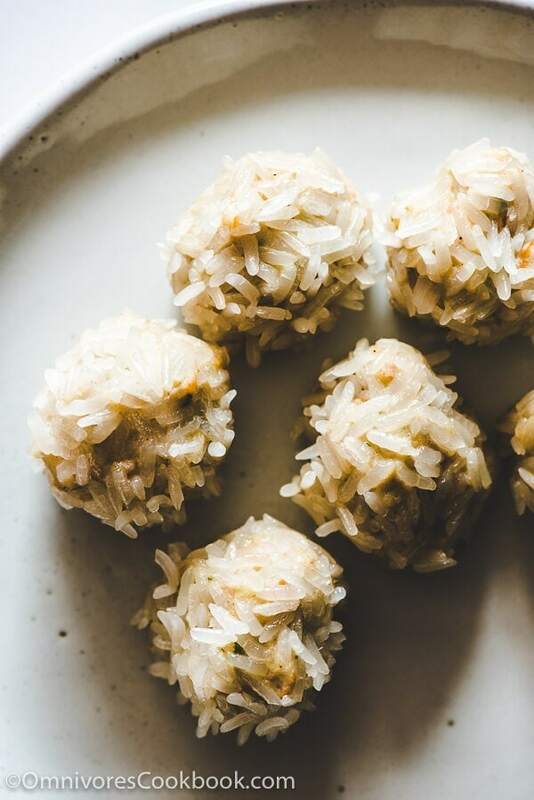 They’re basically steamed pork meatballs, covered in sticky rice. The sticky rice is cooked until translucent, as if covered in snow. The meatballs are very tender and juicy, with a rich umami from the dried shrimp, toasted sesame oil, and fresh herbs. The glutinous rice is soaked with meat juice. Rich and gooey, we didn’t need any dipping sauce to enjoy them. When it comes to making pearl balls, I’m obsessed with flavor and stick to the ingredients my grandma used to use. That’s the reason you’ll find this version has a longer ingredient list than any other recipe out there. 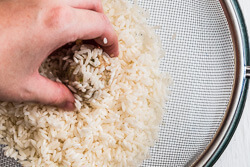 The recipe also calls for pre-soaking the glutinous rice and dried shrimp a day ahead, instead of just a few hours. 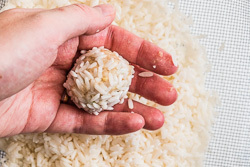 I tried soaking the rice for less time, but the finished meatballs just didn’t taste right. 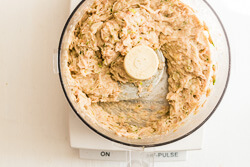 On the other hand, I took a shortcut in order to make the cooking process less tedious – I used a food processor. You can make this dish without one, but a food processor will save tons of chopping time and give you perfectly consistent meatballs. I have attached numerous cooking notes at the end of the recipe, so I won’t repeat them here in the post. 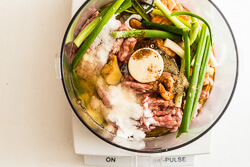 However, I do want to emphasize that you need a relatively fatty grind of meat to make the dish work. I tried using ground turkey, and I won’t say it tasted bad, but it was a bit off for me. Just like with a good sausage, you need 25% to 30% fat content to make it GOOD. If you give this recipe a try, let us know! Leave a comment, rate it once you’ve tried it, and take a picture and tag it #omnivorescookbook on Instagram! I’d love to see what you come up with. Cheers, friends! 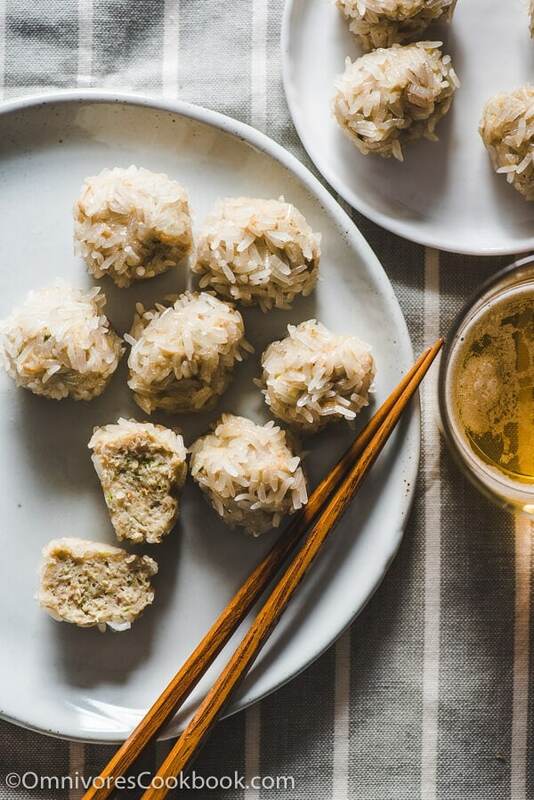 On the day you plan to make the meatballs, drain glutinous rice and dried shrimp. 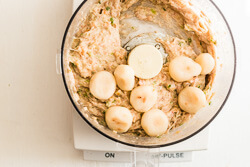 Combine all the ingredients, except the water chestnuts and glutinous rice, in a food processor (*see footnote 3). Pulse a few times. Process until it forms a paste. The paste should be tender but neither runny nor tough. If you find the paste too runny and difficult to shape, you can blend in more cornstarch. If it’s too dry or tough, blend in a bit of water. Add water chestnuts. Process until the water chestnuts are chopped into small bits. Transfer the paste to a bowl. Add 5 cm (2 inches) water to a steamer and bring it to a boil. 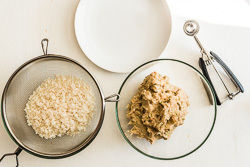 Prepare the paste, the glutinous rice, and an empty plate, all in front of you. 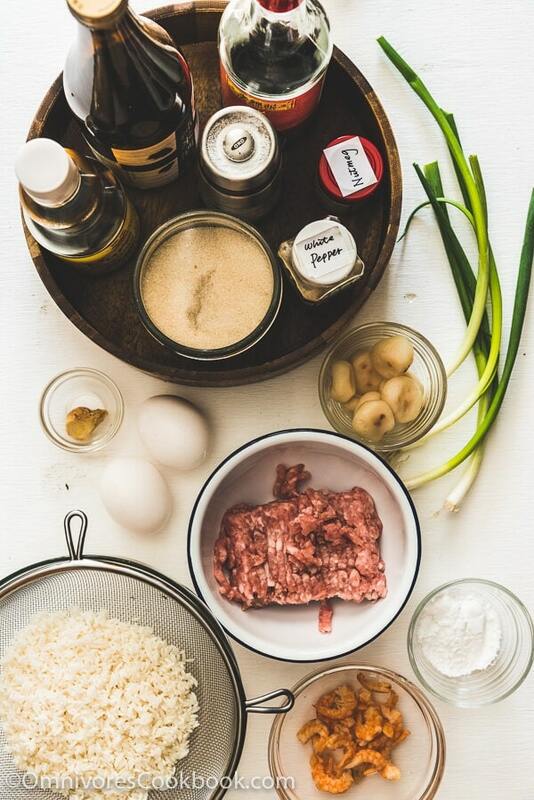 Scoop out about 1 tablespoon of meat paste, shape it into a ball, and roll it in the glutinous rice, until the surface is fully coated with rice. Gently press with hand so that the rice sticks to it. Place meatball on the plate, leaving 1 cm (1/3 inch) between them. Make the rest of the meatballs with the same method. Steam the meatballs for 20 minutes, or until cooked through (*see footnote 4). Store the meatballs in an airtight container in the fridge for up to 4 days, or in the freezer for up to 3 months. The best way to reheat the meatballs is by steaming. It will keep the meatballs moist and tender. If reheating with microwave, add a few drops of water into the bowl and cover it with a plate, to prevent the meatballs from drying out. A higher fat content makes the meatballs very juicy and tender. For an even better taste, use a combination of pork shoulder and pork belly to get higher fat content. You can coarsely chop the meat then grind it in the food processor. 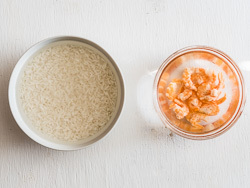 Soaking for less time will result in tough rice and shrimp. You can keep the glutinous rice in the water for up to a day. 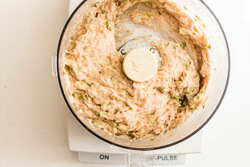 If you do not have a food processor, mince the shrimp, ginger, and green onion finely. Cut the water chestnuts into small bits about the size of corn kernels. 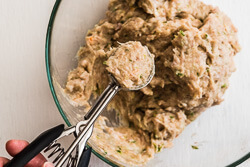 Mix them with the ground meat in a circular motion until it forms a consistent paste. You might need to steam the meatballs in two batches unless you’re using two tiers of bamboo steamer, stacked together. 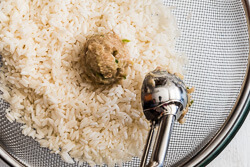 Once you’ve shaped the first batch of meatballs, steam them while shaping the second batch. This dish is intended to be served without sauce. You also serve it with sriracha or a dumpling dipping sauce (1 tablespoon Chinkiang vinegar + 2 teaspoons soy sauce + 1/2 teaspoon sugar + 1/2 teaspoon sesame oil). Thanks for sharing Kevin. Happy Chinese New Year! What do you think about subbing potatoe starch in place for cornstarch or tapioca starch? (I have those on hand…) I can’t wait to make this!! Hi Sheryl, please feel free to use cornstarch or tapioca starch to replace the potato starch. I have tried them all and I don’t see a big difference. so easy to make! such a huge hit with our big parties (i doubled the recipe for 20+ ppl). so awesome. thank u so much! Hi Shauna, wow, I’m so glad to hear you cooked this dish for such a large crowd! You just made my day 🙂 Thanks for taking time and letting me know! Aloha Maggie, I Had to pick up shrimp the day I made the recipe, so I put the dry shrimp in the food processor before I soaked them. This helped shorten the soaking time. Then I used a strainer to drain off the water. I took them to a neighbors and they enjoyed them. This looks fantastic and I”ve got the ingredients ready to go. I do wonder. I’ve also had a shrimp version of this in a few dim sum places here in SF. Made with fresh shrimp, no pork in them. I assume that the recipe would be similar but I wonder about adding a bit of pork fat or other ingredient to make it hold together. Hi Rick, happy to hear that you decided to try out my recipe! 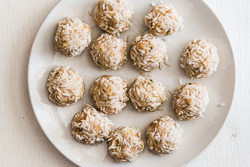 I’ve never tried shrimp pearl balls but it sounds so delicious! Thank you! I tried making these by what my Chinese friend told me but I couldn’t figure out what to put in the mix to make the meat more firm. Anyway, now I know what I can use. I know I am on the right track now! I’m using two lbs of pork to make this for an event. That’s 8 egg whites and it looks like waaaay too much! Is this right?? Other recipes call for 1 egg for 1 lb of meat. This one seems the most authentic so I wanted to use it, but have over a full cup of egg whites at this point. So just checking. If you respond within the hour I will wait to add it last. if not, I guess I’ll just put it all in!